Not videos, but an interesting series of photos for an airliner's adverts..
Johan G wrote in Sun Nov 23, 2014 6:28 pm: While being (relatively) simple, this is an amazing home built cockpit. In the end of the video it is even mounted on a moving platform. I did meet Roland van Roy twice at the FSWeekend in Lelystad. He is very friendly and very talented with mechanics. Ben Collins-Sussman wrote: It is a learned skill to give constructive criticism, whether be it a code review or just a design, a discussion on design, and to take criticism as well. ... It is something we should all aspire to do. How to do it in a nice way. Ben Collins-Sussman wrote: When failure happens, be ready for it. Don't freak out. Document. What did you learn from it? What are you gonna do different next time? If you can do that mental shift and say: "I'm gonna fail and it's no big deal. No fear." And thats fine. You live on, you learn. Your second quote is what I remember of the video when watching it half a year ago. Nice you brought it up. Note: I am quite impressed that with only one afterburner on it could outaccelerate a Lighting on both afterburners. Space Shuttle Discovery UP-CLOSE & INSIDE (45 min). From someone in a group visiting the Space Shuttle Discovery in June 21, 2011, while it was in the process of being decommissioned. Photos taken while she filmed are at the Flickr album @ Space Shuttle Discovery Up-Close. You might like this video of "Project 1794"
Funny thing, the Avrocar. With modern computers as a fly-by-wire system might make such a vehicle even better. Though the ingestion problems would still persist. We were now confident in the vehicles capability to negotiate appreciable obstacles, and a rugged course, partially gravel and partially grass, with a 3 ft deep ditch, was selected for the next flights. Again the Avrocar covered the course successfully, becoming as far as we know the first ground effect machine to negotiate obstacles of this nature. I guess the point was either how narrow one defined "ground effect machine" or that none of the other hovercraft of the time had been documented while passing a ditch. At 23:39 min the narrator says "posigrade" instead of "prograde". I do not remember having heard "posigrade" before. The space shuttle can only change the inclination by +-3 degrees when already in orbit! Oh wow, that chart. Hah. 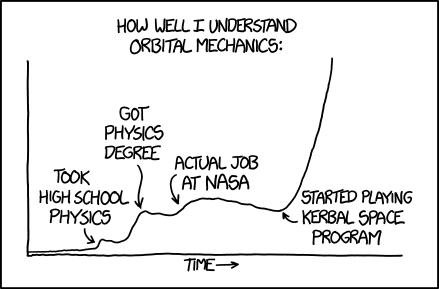 I have to say I have an interest in space and spaceflight for the longest time but it's KSP that really made me understand orbital mechanics (or at least, how it works - I'm still pretty bad at KSP especially orbital rendezvous or planetary intercept). But it was good enough to know just how demanding spaceflight is - I have a friend who didn't play KSP and also interested in space stuff, but he has zero idea what I'm trying to convey sometimes when talking about actual spacecraft maneuvers which I understood from KSP. I took the liberty to move the crosswind landings video to the topic Re: Accidents and Incidents / Amazing Landings & Take Offs.